Word broke yesterday that the owners of Loreley, the Lower East Side beer hall, are looking to expand into Williamsburg. So naturally, we've got to ask, can North Brooklyn handle yet another beer hall? Our short answer: probably, yes. These joints are for the yuppies, the hipsters, the trend-alcoholics, and manhattanites escaping for a drink. They love flashy new things like this. Our long answer: Probably, yes! The nabe's already home to the jam-packed Radegast Beer Hall, the trendier Berry Park, and the sometimes-event spot sometimes-sports lounge TBD. 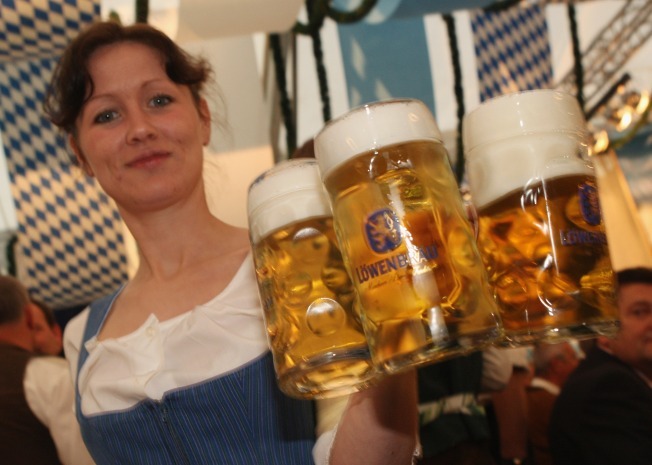 People here are bred to open their collective wallets to stuff the bedding of a new biergarten. And from a geographic standpoint, this new spot is a step outside of the comfort zone for many liquor entrepreneurs. Sandwiched a short walk between the Lorimer L stop and McCarren Park, the spot will takeover an old gas station at 64 Frost Street. The owners hope to be DOB-approved by this time next month, and will presumably be filling the doors by turkey day. Let us be thankful for this most wonderful of German traditions.